Blake Jorgenson Photo. Courtesy Whistler Blackcomb. -as part of a Workplace Conservation Awareness program, a team of 15 WB employees meet monthly to develop programs to improve conservation initiatives and boost awareness about sustainability – ongoing reductions have been achieved through a variety of initiatives from the installation of light timers and energy efficient lighting to investments in equipment upgrading and operations. The resort reduced its power consumption by 4 percent last year (enough to power 140 homes for a year) and operates a new $32 million micro-hydro-electric plant, which is located inside the ski area and produces enough clean electricity for its entire operations. -WB is participating in a pilot Energy Manager program with BC Hydro to create an annual plan that identify 5 areas and develop a plan to ensure ongoing reduction in energy consumption focused on conservation through increased awareness and cultural change. Michael Allen Photo. 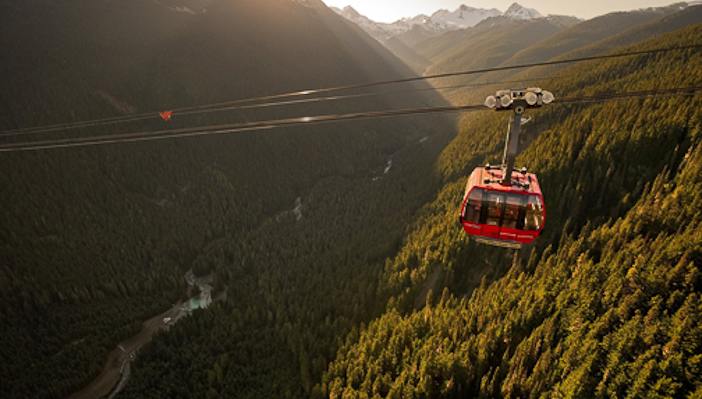 Courtesy Whistler Blackcomb. -WB employees host ecology and wildlife viewing tours for visitors in addition to showcasing its environmental initiatives at interpretive sites throughout the resort property. -WB introduced recycling and composting programs in 2005 and has since implemented many initiatives as it works toward the goal of zero waste. The program covers everything from organic compost and reduced packaging in its restaurants to electronics, paint and waste-motor-oil disposal. -approximately 60 WB employees participate in a carpool program that uses 5 company vehicles and is estimated to save over 64,000 km of driving as well as over 86,000 litres of fuel that equals a reduction of over 200 tonnes of carbon dioxide emissions each year. Jordan Manley Photo. Courtesy Whistler Blackcomb. -through its Operation Green-Up program, WB boasts a number of ongoing efforts to enhance the natural environment, including projects to limit erosion in watersheds, protect drinking water, and apply planting strategies that reintroduce native species and seed mixes to support wildlife. More about WB’s enviro mission here.